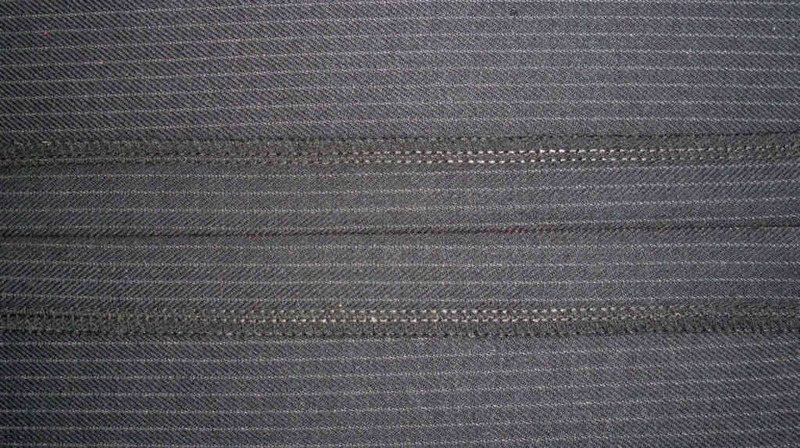 An open seam on some scrap Holland and Sherry black pinstripe. Some time ago I inherited a piece of Holland and Sherry black pinstripe suiting material and as it was not very large, I made a pair of stubbies out of it. Today while cleaning up some of my bits and pieces I found a few of the offcuts so I did a test piece of a secured edge open seam. The fabric is very light, about super 120 but very well behaved, I overlocked the two edges with a 4 thread safety stitch then ironed the seam from both the back and the front to get it genuinely flat. The two photos below are the results. This is the back view, it shows the overlocked edges with the seam allowance and ironed as flat as you can get it. This is the front view which has also been directly ironed yet there is no print through of the two secured edges. Note that I did not bother to match the stripes properly as it does not matter in a test piece.